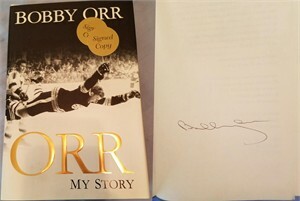 My Story hardcover book autographed in black ballpoint on the inside cover by author and legendary Hockey Hall of Famer Bobby Orr. Obtained at book signing, authenticated by Beckett Authentication Services (BAS) with their matching numbered sticker and certificate of authenticity card. ONLY ONE AVAILABLE FOR SALE.